The following are clinical details of the meta-analysis. A total of 27 out of 30 studies made extensive use of the Yingxiang point. This point is anatomically located on the nasolabial groove, at the midpoint of the lateral border of the ala nasi. This acupuncture point is located on the hand Yangming large intestine meridian. It is also the crossing point of the stomach and the large intestine meridians. Needling this point smooths the flow of qi in the meridians and clears obstructions from the nasal orifice. This point is traditionally indicated for Bi Yuan (nasal congestion), Bi Qiu (sniveling nose), and Bi Niu (nosebleed). According to Traditional Chinese Medicine principles, the lungs and large intestine have an interior-exterior relationship (i.e., the lungs and large intestine are functionally interconnected). As a result, diseases of the lungs can be treated by needling acupuncture points on either the lung meridian or the large intestine meridian. A total of 23 studies document use of the Yintang point. This acupoint is located between the two medial ends of the eyebrows in the glabella. Yintang plays a key role in “opening the orifices and regulating the spirit.” Needling this point promotes qi and blood circulation of the head and also stabilizes the mind and spirit. A total of 17 studies used the Hegu point. Hegu is the Yuan-source point of the hand Yangming large intestine meridian. Needling this point disperses obstructions in the Yangming meridian and regulates the lung qi. A total of 14 studies used Zusanli. Zusanli is the He-confluence point of the foot Yangming stomach meridian, which starts at the side of the nose. The stomach meridian of foot yangming primary channel begins at the side of the nose at Yingxiang (LI20) and then ascends to the root of the nose where it intersects with Jingming (BL1). Zusanli activates local qi and blood circulation and removes local obstructions affecting the meridians. Needling this point also regulates the stomach, intestines, and lungs for purposes of strengthening the internal organs related to allergic rhinitis. A total of 11 studies used Shangyingxiang (also known as Bitong). Needling this point promotes local qi and blood circulation and relieves nasal congestion. This acupoint is located near the upper end of the nasolabial groove, at the junction of the maxilla and the nasal cavity. Scientific investigations confirm that acupuncture is a reasonable treatment option for patients with allergic rhinitis. To learn more, consult with your primary licensed acupuncturist or licensed acupuncturists in your area. Qu SH, Liu YX. Systematic Review and Meta-analysis of the Randomized Controlled Trial of Acupuncture for Allergic Rhinitis [J]. World Journal of Integrated Traditional and Western Medicine, 2016,11(07):900-906+948. Varshney J, Varshney H. Allergic Rhinitis: an Overview [J]. Indian J Otolaryngol Head Neck Surg. 2015 Jun; 67(2): 143–149. Palma-Carlos AG1, Branco-Ferreira M, Palma-Carlos ML. Allergic rhinitis and asthma: more similarities than differences [J]. Allerg Immunol (Paris). 2001 Jun;33(6):237-41. Xia J, Peng D. Acupuncture Combined with Herbal Medicine for Treatment of Allergic Rhinitis and Its Effectiveness on Downregulating Ig E、TNF-α、IL-4 and IL-12 [J]. International Journal of Laboratory Medicine, 2018,39(03):374-377. Feng, Shaoyan, Miaomiao Han, Yunping Fan, Guangwei Yang, Zhenpeng Liao, Wei Liao, and Huabin Li. “Acupuncture for the treatment of allergic rhinitis: a systematic review and meta-analysis.” American journal of rhinology & allergy 29, no. 1 (2015): 57-62. Taw, Malcolm B., William D. Reddy, Folashade S. Omole, and Michael D. Seidman. “Acupuncture and allergic rhinitis.” Current opinion in otolaryngology & head and neck surgery 23, no. 3 (2015): 216-220. Authors: UCLA Center for East-West Medicine, UCLA (University of California, Los Angeles) Department of Medicine, David Geffen School of Medicine at UCLA bIntegrative Healthcare Policy Consortium, Pinecrest Wellness Center cDepartment of Family Medicine, Morehouse School of Medicine dDepartment of Otolaryngology – Head and Neck Surgery, Henry Ford Health System, Michigan. Researchers find acupuncture effective for relieving allergic asthma, a type of asthma triggered by allergens (e.g., dust mites, mold, pollen, foods). Symptoms include wheezing, difficulty breathing, itchy eyes, sinusitis, rhinitis, a general feeling of malaise, and sneezing. In a randomized controlled trial of 1,445 patients, acupuncture provided lasting relief for six months. Acupuncture was provided for a maximum of 15 treatments over a three month period. Patients receiving acupuncture demonstrated significant relief from allergic asthma at all data points, including the six month post-treatment follow-up data point. Only manual acupuncture was administered. Laser acupuncture, electroacupuncture, and moxibustion were not permitted for the purposes of eliminating variables in the investigation. Healthcare costs for acupuncture treatment were covered by a cooperative agreement between insurance companies and the university researchers conducting the study. Patients receiving acupuncture had marked reductions of allergic asthma during strenuous and moderate exercise, work and social activities, and during sleep. The overall quality of life scores for patients receiving acupuncture were significantly higher than patients in the control group receiving no acupuncture. All patients were allowed usual care and acupuncture was an additional treatment modality for patients in the the acupuncture groups. The researchers note, “study results reveal that the use of acupuncture as adjunct to the routine care of allergic bronchial asthma was superior to routine care alone in improving both specific symptoms and general quality of life.”  Secondary outcome measures document that patients were satisfied with acupuncture treatment results. The study allowed for real life clinical applications of acupuncture, except for the limitation to manual acupuncture. The acupuncture point prescriptions, including the number of acupoints used, were individualized for each patient. This differs from many research designs wherein a primary acupuncture point prescription is designated for all patients. Secondary acupuncture points are often allowed for specific medical considerations. In this study, the researchers allowed for complete customization of all acupuncture points based upon clinical presentations with no limitations to primary and secondary acupoint protocols. The acupuncture treatment and drugs-only groups received drug therapy with beclometasone dipropionate and theophylline. Beclometasone dipropionate (a steroid) was provided in the form of an inhaler, 250 µg each dose, one time per day. Theophylline (a bronchodilator) was taken once per day in the from of 0.2 gram sustained-release tablets. Yuji (LU10) was inserted first to an insertion depth of 0.5–1 cun. The needle was manipulated with strong attenuation techniques and was retained for 25 minutes. During retention, the needle was manipulated every five minutes. Feishu (BL13) and Dazhui (GV14) received standard insertion with equal reinforcement and attention techniques with lifting, thrusting, and rotating. Feishu (BL13) and Dazhui (GV14) were retained for 15 minutes, followed by cupping or warm needle acupuncture. For the remaining acupoints, the needles were manipulated with attenuation techniques (moderate to strong stimulation) and were then retained for 25 minutes. The results demonstrate that acupuncture provides significant relief from asthma when added to a usual care regimen. In a separate investigation, an examination of Taiwan’s Bureau of National Health Insurance (BNHI) records yielded a sample size of 12,580 asthmatic children. Children with asthma receiving a combination of acupuncture, herbal medicine and drug therapy have superior patient outcomes, less visits to emergency rooms, and fewer hospitalizations than children receiving only drug therapy. In a 15 multi-hospital five year study, Traditional Chinese Medicine (acupuncture, herbal medicine, Chinese Tuina massage, herbal pastes) was combined with pharmaceutical drugs including inhaled bronchodilators and steroids in the study protocol. Brinkhaus, Benno, Stephanie Roll, Susanne Jena, Katja Icke, Daniela Adam, Sylvia Binting, Fabian Lotz, Stefan N. Willich, and Claudia M. Witt. “Acupuncture in patients with allergic asthma: a randomized pragmatic trial.” The Journal of Alternative and Complementary Medicine 23, no. 4 (2017): 268-277. Wu JH. Effective observation on treating 68 cases of bronchial asthma by acupuncture plus medicine [J]. Clinical Journal of Chinese Medicine, 2016, 8(13): 109-111. Hung, Yu-Chiang, I-Ling Hung, Mao-Feng Sun, Chih-Hsin Muo, Bei-Yu Wu, Ying-Jung Tseng, and Wen-Long Hu. “Integrated traditional Chinese medicine for childhood asthma in Taiwan: a Nationwide cohort study.” BMC complementary and alternative medicine 14, no. 1 (2014): 389. Investigators find acupuncture effective for the treatment of IBS (irritable bowel syndrome). In a controlled study, Yiwu Central Hospital researchers conclude that acupuncture has a 90.7% total effective rate for IBS-D patients. Perhaps more importantly, acupuncture produces a 34.9% complete recovery rate. The total recovery rate accounts for all patients showing significant improvements and the complete recovery rate is a quantitative measure of all patients cured of IBS-D by acupuncture therapy. Results were determined from both subjective and objective data. Subjectives were based on improvements in bowel movement frequency, shape, texture, and consistency. Subjectives also included measures of abdominal discomfort, anxiety, and sleep improvements. Objective data was based on changes of 5-hydroxytryptamine (5-HT), neuropeptide Y (NPY) and calcitonin gene-related peptide (CGRP) serum expression using automated ELISA analysers. The 90.7% total effective rate and the 34.9% complete recovery rate were calculated based on the the subjective and objective data. In this article, we are going to take a close look at the acupuncture points that achieved the results. First, let’s review a little about IBS before getting into the details. Irritable bowel syndrome (IBS) is a disorder affecting the digestive system. It is characterized by recurring abdominal pain and discomfort associated with alterations in the frequency of bowel movements or consistency of stool. At present, the occurrence of IBS is related to the patient’s history of gastroenterological viral infections, psychological factors, age, gender, occupation, history of medications, intestinal microflora balance, metabolic disorders of brain-intestinal axis, and other factors. Based on the main pathological manifestations, IBS can be classified into four subtypes: IBS-D (diarrhea-predominant), IBS-C (constipation-predominant), IBS-M (mixed), and unspecified IBS (IBS-U). According to Traditional Chinese Medicine (TCM) principles, diarrhea-predominant IBS (IBS-D) belongs to the “diarrhea” (xie xie) and “abdominal pain” (fu tong) categories. The main causes of IBS are stagnation of liver qi, deficiency of the spleen and kidneys, and the invasion of cold and heat pernicious influences. These result in gastrointestinal imbalances. TCM principles note that IBS is easily exacerbated by changes in the diet. Patients in the control group were given the following herbal medicines over a 30-day period. The first medication was Spleen and Bowel-Reinforcing Pills (bǔ pí yì cháng wán), manufactured by China Resources Pharmaceutical Group Ltd. It was administered in 6-gram doses that were orally administered 3 times per day, after meals. In addition, patients were given herbal medicine in the form of Xiao Yao Wan (Hubei Wushi Pharmaceuticals) in 6-gram doses. The herbal pills were orally administered twice per day, after breakfast and after dinner. Patients experiencing severe diarrhea and cold syndromes received ginger moxibustion (ge jiang jiu) at Shenque CV8. Treatment was administered 5 times per week, over the course of 30 days. The above acupoints are key for benefitting the liver and spleen. The combined use of these acupoints is able to sooth the liver and strengthen the spleen (shu gan jian pi), firm the intestines and stop diarrhea (gu chang zhi xie), and promote the harmonious rise and fall of spleen and stomach qi. As IBS sufferers are prone to emotional disorders, acupuncture therapy at Yintang (MHN3) and Baihui (GV20) was added for a tranquilizing effect. Clinical efficacy was evaluated and compared after one course of treatment by assessing indicators such as main symptoms, psychological status, and sleep quality. Expressions of 5-hydroxytryptamine (5-HT), neuropeptide Y (NPY) and calcitonin gene-related peptide (CGRP) in serum samples were measured and compared before and after the intervention. SAS: Patients who scored 50–59 points had mild levels of anxiety, 60–69 points had moderate levels of anxiety, and ≥70 points had extreme levels of anxiety. SDS: Patients who scored 53–62 points had mild levels of depression, 63–72 points had moderate levels of depression, and >72 points had extreme levels of depression. Sleep quality was evaluated using the Pittsburgh Sleep Quality Index (PSQI), and was scored on a range of 0 to 21 points, with higher scores depicting better sleep quality. Serum levels of 5-HT, NPY, and CGRP were analyzed (5 mL of fasting peripheral venous blood was obtained from each patient 1 day before the start of treatment and one day after the entire course of treatment). Blood samples were centrifuged at 3000 r/min for five minutes to obtain the serum for analysis. Treatment cured IBS: Absence of abdominal discomfort and related symptoms. Bowel movement appears normal and patients pass stool no more than 2 times daily. Treatment was highly effective: Significant improvement of various symptoms and reduction in stool frequency. Shape, texture and consistency of stool appear normal. Treatment was fairly effective: Alleviation of abdominal discomfort, reduction in stool frequency and improvement in shape, texture and consistency of stool. Treatment was ineffective: No improvement or worsening of the main symptoms. The recovery rate was 34.9% and the total effective rate was 90.7% in the observation group, versus 18.6% and 79.1% in the control group, and the total clinical efficacy of the observation group was significantly better than that of the control group (P＜0.05). Both groups displayed significant improvements in the main symptoms after the intervention (P＜0.05), with main symptoms scores of the observation group significantly better than those of the control group (P＜0.05). Both groups’ SAS, SDS, and PSQI scores improved after treatment (P＜0.05) and the post-treatment SAS, SDS, and PSQI scores of the observation group were better than those of the control group (P＜0.05). Only 5-HT levels were downregulated in the control group after the treatment (P＜0.05). Levels of 5-HT, NPY and CGRP were downregulated in the observation group after the treatment (P＜0.05). All three indicators were lower in the observation group than those in the control group after the intervention (P＜0.05). The results indicate that acupuncture is an effective treatment modality for patients with IBS-D. Patients interested in acupuncture for the treatment of IBS are encouraged to consult with local licensed acupuncturists to learn more about treatment options. 1. Liu ZH, Qi AZ,Li ZR et al. Pathological analysis of Irritable Bowel Syndrome in Chinese Medicine [J] Shaanzi Journal of TCM,2005,26(9):974–975. 2. Li GY. Clinical Observation of Acupuncture-moxibustion in Treating Irritable Bowel Syndrome [J] Shanghai Journal of Acupuncture and Moxibustion, 2018, 37(2):187–191. 3. Drossman DA. The functional gastrointestinal disorders and the Rome Ⅲ process[J]. Gastroenterology, 2006,130 (5):1377-1390. 4. Chinese Society of Traditional Chinese Medicine Branch of the Spleen and Stomach. Consensus on Diagnosis and Treatment of Irritable Bowel Syndrome [J] China Journal of Traditional Chinese Medicine and Pharmacy, 2010,25(7):1062-1063. 5. Zheng XY. Guiding Principles of Clinical Research on New TCM Drugs (Trial) [S].Beijing: China Medical Science and Technology Publishing House,2002:139-143. 6. Kong SP,Wang WQ,Xiao N,et al. Clinical Study on Diarrhea-Predominant Irritable Bowel Syndrome Treated by Acupuncture and Ginger Moxibustion [J]. Shanghai Journal of Acupuncture and Moxibustion,2014,33(10):895-898. University of California School of Medicine researchers have proven that acupuncture lowers blood pressure in subjects with hypertension. The depth and breadth of the research extends across multiple university controlled studies. The investigations also reveal how acupuncture works; the biological mechanisms stimulated by acupuncture are no longer a mystery. The University of California School of Medicine, Irvine, researchers determined several key items. Acupuncture produces long-lasting lowering of blood pressure in subjects with hypertension. Acupuncture regulates sympathetic nervous system responses resulting in lower blood pressure in cardiovascular related centers of the brain and “specific neurotransmitter systems.”  In addition, their cross-over double blinded research identifies specific acupuncture points and procedures that are especially effective for lowering blood pressure. The researchers note that electroacupuncture is effective “at two sets of standardized acupoints known to provide input to brain stem regions that regulate sympathetic outflow lowers blood pressure….”  They highlight three key points. First, electroacupuncture that is administered once per week in 30 minute acupuncture sessions over a period of 8 weeks is effective for lowering blood pressure in patients with hypertension. Second, results are observed by the second week of acupuncture therapy and last for 4–6 weeks if no follow-up treatment is administered after completion of the 8 weeks of acupuncture therapy. Third, monthly acupuncture maintenance treatments maintain the healthy low blood pressure for at least 6 months. The University of California School of Medicine researchers find electroacupuncture a mediator of the autonomic nervous system. Plasma norepinephrine and renin-aldosterone measurements indicate that electroacupuncture lowers blood pressure by downregulating sympathetic nervous system outflows. This mechanism resulted in a lowering of both systolic and diastolic blood pressure in subjects with hypertension. Furthermore, the researchers successfully differentiated acupuncture points that were effective from those that were not. Electroacupuncture applied to PC5 (Jianshi)–PC6 (Neiguan) and ST36 (Zusanli)–ST37 (Shangjuxu) was found effective for lowering blood pressure. Electroacupuncture applied to LI6 (Pianli)–LI7 (Wenliu) and GB37 (Guangming)–GB39 (Xuanzhong, Juegu) was ineffective. Using 24/7 ambulatory blood pressure monitoring equipment, electroacupuncture applied to PC5–PC6 and ST36–ST37 was effective for reducing peak and average systolic and diastolic blood pressure. The results were published in the Journal of Intensive and Critical Care. The researchers conclude that electroacupuncture “demonstrates a range of cardiovascular responses” and the levels of “visceral reflex pressor responses are influenced by the anatomic location of somatic nerves beneath the acupoints.”  They identified specific responses; “deep nerves exerting strong influence and superficial cutaneous nerves demonstrating little or no attenuation of cardiovascular reflex responses.”  The acupuncture continuing education results were published in the American Journal of Physiology – Regulatory, Integrative and Comparative Physiology. Another investigation by the University of California researchers was published in Autonomic Neuroscience. The research identifies specific regions of the brain regulated by acupuncture. Based on the findings, they conclude that electroacupuncture “suppresses elevated blood pressure (BP) by activating the arcuate nucleus, ventrolateral periaqueductal gray (vlPAG), and inhibiting cardiovascular sympathetic neurons in the rostral ventrolateral medulla.”  The research documents that “a reciprocal excitatory glutamatergic neural circuit between the arcuate and vlPAG contributes to long-lasting EA [electroacupuncture] cardiovascular inhibition.”  Glutamatergic biochemicals regulate the excitatory amino acid system throughout the body and brain. The above-mentioned studies are only a fraction of the published research on acupuncture and its mediation of cardiovascular and cortical activity. Important is that there is both clinical and laboratory research that is blinded, randomized, and sham controlled. The findings determine efficacy rates for specific acupuncture points for specific conditions and the biological mechanisms responsible for positive patient outcomes. The University of California School of Medicine, Irvine, (UCI) researchers provide us with great insight into the active mechanisms involved in acupuncture treatments. 1. Tjen-A-Looi, Stephanie C. “Reduction of Blood Pressure by Electro Acupuncture in Mild to Moderate Hypertensive Patients: Randomized Controlled Trial.” Journal of Intensive and Critical Care 3, no. 1 (2017): 2, pg.1. 9. Tjen-A-Looi SC, Li P, Longhurst JC (2004) Medullary substrate and differential cardiovascular responses during stimulation of specific acupoints. Am J Physiol Regul Integr Comp Physiol 287: R852-R862. 13. Li P, Tjen-A-Looi SC, Guo ZL, Longhurst JC (2010) An arcuateventrolateral periaqueductal gray reciprocal circuit participates in electro acupuncture cardiovascular inhibition. Auton Neurosci 158: 13-23. 15. Tjen-A-Looi SC, Li P, Longhurst JC (2009) Processing cardiovascular information in the vlPAG during electroacupuncture in rats: roles of endocannabinoids and GABA. J Appl Physiol 106: 1793-1799. 17. Moazzami A, Tjen-A-Looi SC, Guo ZL, Longhurst JC (2010) Serotonergic projection from nucleus raphe pallidus to rostral ventrolateral medulla modulates cardiovascular reflex responses during acupuncture. J Appl Physiol 108: 1336-1346. 19. Tjen-A-Looi SC, Li P, Longhurst JC (2007) Role of medullary GABA, opioids and nociceptin in prolonged inhibition of cardiovascular sympathoexcitatory reflexes during electro acupuncture in cats. Am J Physiol Heart Circ Physiol 293: H3627-H3635. 21. Zhou W, Fu LW, Tjen-A-Looi SC, Li P, Longhurst JC (2005) Afferent mechanisms underlying stimulation modality-related modulation of acupuncture-related cardiovascular responses. J Appl Physiol 98: 872-880. 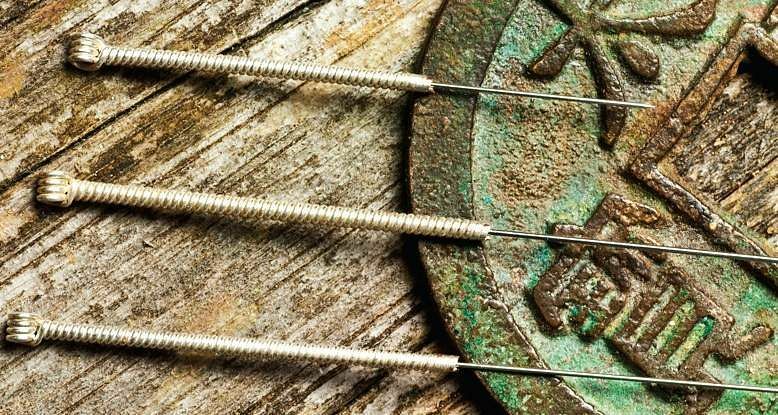 “Researchers from Memorial Sloan Kettering Cancer Center (MSK) in New York City and MD Anderson Cancer Center in Houston, examined if acupuncture could help manage symptom burden of hematopoietic stem cell transplantation (HCT) in patients with multiple myeloma. “Combining non-drug therapy with drug therapy for better symptom management is the future direction of cancer supportive care,” he said [Gary E. Deng, M.D., Ph.D., medical director, Integrative Medicine Service at MSK]. In the trial, patients underwent high-dose melphalan – a prescription chemotherapy drug used as a conditioning treatment prior to HCT – followed by autologous HCT, which is when the cells used in the transplant are the patient’s own. Deng plans to take this research further. He hopes to get funding to support a larger study, which would allow him to examine acupuncture to alleviate symptom burden of HCT with a bigger patient population. Deng, G., Giralt, S., Chung, D. J., Landau, H., Siman, J., Coleton, M., … & Cassileth, B. (2017). Acupuncture for reduction of symptom burden in multiple myeloma patients undergoing autologous hematopoietic stem cell transplantation: a randomized sham-controlled trial. Supportive Care in Cancer, 1-9. Over half of all women experience primary dysmenorrhea, and many consider their menstrual pain inevitable. However, the prevalence of pain implies neither normalcy nor necessity. In the occident, acupuncture has recently gained popularity for women’s reproductive health conditions, especially infertility. Nevertheless, believing that pain an inevitable consequence of being born a woman, many do not seek acupuncture to treat their dysmenorrhea; in some cases, it is only after seeking out acupuncture for other conditions that women are educated in its potential to treat their menstrual pain. In Traditional Chinese Medicine (TCM), dysmenorrhea (including menstrual pain and other pre-menstrual symptoms) is considered a disorder just as worthy of treatment as any disease. Researchers at The National Institute of Complementary Medicine at Western Sydney University in Australia conducted a study to compare the efficacy of manual acupuncture and electro-acupuncture, at two timing intervals, for the treatment of primary dysmenorrhea. The researchers found that, in all cases, acupuncture leads to a significant reduction in the intensity and duration of menstrual pain after three months of treatment, and the results were sustained one year after trial entry. This study, along with others in the same vein, will hopefully be encouraging for those women who suffer each month from dysmenorrhea. Amongst women, dysmenorrhea is the most common cause of absenteeism from school and work, and it may also lead to “a reduction in academic performance, reduced participation in sport and social activities and an overall significant decrease in women’s quality of life. Despite the significant negative impact and disruption to daily living that primary dysmenorrhea has on women most do not seek medical treatment. When women do present to their doctor with primary dysmenorrhea, the most commonly prescribed treatments are non-steroidal anti-inflammatories (NSAIDs) and the combined oral contraceptive (COC) pill.”  While these treatments help some women, they are ineffective or unpalatable for others. “Lack of satisfaction in standard treatment leads to an increase in self-care, with women commonly using complementary therapies to deal with their menstrual pain in addition to, or instead of, pharmaceutical pain relief, due to a lack of perceived effectiveness or a dislike of using analgesic medication”  Alternative therapies such as acupuncture are gaining traction as women find practitioners that take their conditions seriously and offer tangible relief without medication. In Traditional Chinese Medicine (TCM), dysmenorrhea refers to recurrent abdominal or lumbosacral pain experienced before, during, or after menstruation. According to TCM theory, there are three primary etiologies, each manifesting according to its root cause: liver qi stagnation, cold accumulation, and qi and blood deficiency. Liver qi stagnation causes distending pain in the lower abdomen, which may refer to the waist and back; when qi stagnation leads to blood stasis, there may be spells of sharp, stabbing pain, which is relieved by the passing of small clots of menstrual blood. Stagnated liver qi can also cause the irritability and emotional issues associated with PMS. Similarly, cold accumulation will slow and coagulate the blood, causing blood stasis; this pattern causes the sharp, stabbing pain associated with blood stasis, as well as the cramping or contracting of the uterine muscles due to cold accumulation. Alternatively, deficient qi and blood fail to nourish the uterus, leading to dull, aching pain that may occur during or after menstruation. Both the excess cold and qi and blood deficiency patterns can be alleviated by warmth, and thus moxibustion — the burning of mugwort on or near the body at acupoints or around the area of pain — is indicated for both of these etiologies. According to Hsu et al., “the syndrome of cold coagulation and blood stasis is mostly seen,”  though, considering how few women seek out treatment for dysmenorrhea, it is possible that this pattern is more common clinically because of the extreme pain and cramping associated with this pattern, as compared to the relatively mild — or manageable — pain associated with the patterns. The prevailing theory is that the changes in uterine micro-circulation and contractility associated with dysmenorrhea are related to the disordered production of endometrial prostaglandins (PGs), endogenous hormone-like lipid compounds. During the luteal phase, women have increased levels of PGs. However, women with dysmenorrhea have notably higher levels of circulating PGs than eumenorrheic women, especially during the first 48 hours of their menses, when their symptoms peak. Furthermore, “the severity of menstrual pain and associated symptoms of dysmenorrhea are directly proportional to the amount of PGs released,”  confirming that altered PG levels are the likely cause of pain. In another study, Zahradnik et al. studied the menstrual blood collected from both eumenorrheic and dysmenorrheic women and found that dysmenorrheic women had a concentration of prostaglandin F2α (PGF2α) that was 2.5 times higher than eumenorrheic women, though their levels of prostaglandin E2 (PGE2) were identical. Hsu et al. attributed dysmenorrheic pain to this increase in the ratio between PGF2 and PGE2: “while PGE2 may result in either myometrial contraction or relaxation, PGF2a always causes potent vasoconstriction of uterine blood vessels, and myometrial contractions.”  As vasoconstriction causes a decrease in blood flow, myometrial contractions increase the need for oxygenated blood; the prevalence of these two factors together lead to hypoxia. Doppler ultrasonography, used to investigate uterine blood flow, has similarly shown, “that the strong and abnormal uterine contractions in women with dysmenorrhea during menstruation are associated with reduced uterine blood flow and resultant myometrial ischemia, and hence pain.”  PGs also have a range of biological effects on a wide variety of physiological and pathological activities — including pain, inflammation, body temperature, and sleep regulation  — so disproportionate production may be related to some of the secondary effects of dysmenorrhea as well. DeQi was obtained at all acupoints at the beginning of the treatment. “DeQi (the arrival of Qi) is the sensation generated by the insertion and/or manipulation of an acupuncture needle in an acupuncture point,” and TCM practitioners consider this important an important variable in the efficacy of a treatment. [23a] For the patient, DeQi feels like soreness, pressure, or heaviness at the site of insertion; for the practitioner, it is an indication that the qi has begun to flow at the acupoint, accessing the unique energy of the point to heal. Treatment timing was tested by separating the participants into high and low frequency test groups. “All women in the study were scheduled to receive 12 treatments over the course of three menstrual cycles. Women in the high frequency (HF) group received three treatments in the seven days prior to the estimated day one of the menstrual cycle. 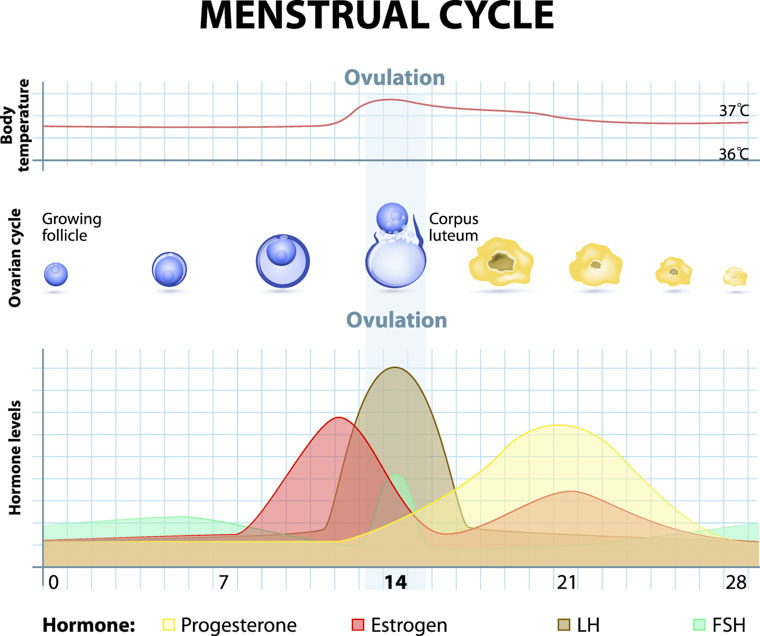 Women in the low frequency (LF) group received three treatments in the time between menses, approximately every seven to ten days’ dependent on cycle length.”  The 2×2 factorial design lead to a total of 4 test groups: LF-MA, HF-MA, LF-EA, and HF-EA. The researchers also compared health related quality of life (HRQoL), supplementary analgesic use, and secondary symptoms. HRQoL measures subjective physical and mental well-being, by collecting participant data on factors including body pain, vitality, social function, and mental health. Decreased nonsteroidal anti-inflammatory drug (NSAID) use, measured in mean doses per day,  is thought to be another way of measuring pain relief, since patients will only take medications once their pain meets their personal threshold. Secondary symptoms may vary between women, but common symptoms include mood changes, bloating, and breast tenderness. The results indicate that high frequency and manual treatments show better results for these factors. “Health related quality of life increased significantly in six domains in groups having high frequency of treatment compared to two domains in low frequency groups. Manual acupuncture groups required less analgesic medication than electro-acupuncture groups.”  More specifically, manual acupuncture provides the same — or greater — pain relief, while simultaneously decreasing the analgesic medication required. Of all groups, HF-MA had the best results for the reduction of secondary menstrual symptoms compared:  “after the course of acupuncture treatment, participants had less problems with work or daily activities as a result of their physical health, less pain and subsequent limitations due to pain, more energy, and less interference from physical and emotional problems in social activities, all of which are commonly experienced by women with primary dysmenorrhea.”  The use of moxa for indicated conditions, which was found by Yang et al. to regulate PGF2 and PGE2 levels,  may have also contributed to the lasting effects of the course of treatment. The most important result of this study, and others like it, is that menstrual pain is not inevitable. Many women may feel that medications — either NSAIDs or oral contraceptives — are their only option for treating their monthly symptoms, but acupuncture has been shown to be equally effective, and its effects last long after the course of treatment. Additionally, TCM practitioners provide individualized advice that helps women take an active role in caring for themselves. Acupuncture can provide a safe and effective alternative to medications. This study shows that the abdominal pain and emotional symptoms of primary dysmenorrhea can be addressed with TCM, and it will hopefully empower women to address their menstrual pain holistically and efficiently. 1 Armour, Mike, Hannah G. Dahlen, Xiaoshu Zhu, Cindy Farquhar, and Caroline A. Smith. “The role of treatment timing and mode of stimulation in the treatment of primary dysmenorrhea with acupuncture: An exploratory randomised controlled trial.” Plos One 12, no. 7 (2017). pg 2. 2 Armour et al, The role of treatment timing and mode of stimulation, pg 2. 3 Iacovides, Stella, Ingrid Avidon, and Fiona C. Baker. “What we know about primary dysmenorrhea today: a critical review.” Human Reproduction Update vol 21, no 6, (2015). Pg 764. 4 Armour et al, The role of treatment timing and mode of stimulation, pg 2. 5 Armour et al, The role of treatment timing and mode of stimulation, pg 2. 6 Cheng, Xinnong, ed. Chinese Acupuncture and Moxibustion. Beijing: Foreign Languages Pr, 2012. Pgs475-477. 7 Chinese Acupuncture and Moxibustion, pgs 475-477. 8 Hsu, Wing-Sze, Xiao-Yu Shen, Jia-Min Yang, Li Luo, Ling Zhang, Dan-Dan Qi, Song-Xi Shen, Shi-Peng Zhu, Ya-Fang Zhao, Xiao-Xuan Ren, Meng-Wei Guo, Xiao-Hong Li, Bo Ji, Lu-Fen Zhang, and Jiang Zhu. “Effects of Acupuncture Applied to Sanyinjiao with Different Stimuli on Uterine Contraction and Microcirculation in Rats with Dysmenorrhea of Cold Coagulation Syndrome.” Evidence-Based Complementary and Alternative Medicine 2014 (2014): 6. 9 Hsu et al., Effects of Acupuncture Applied to Sanyinjiao, pg 6. 10 Hsu et al., Effects of Acupuncture Applied to Sanyinjiao, pg 7. 11 Iacovides, et al., What we know about primary dysmenorrhea today, pgs 765-6. 12 Zahradnik, H. P., and M. Breckwoldt. “Contribution to the pathogenesis of dysmenorrhea.” Archives of Gynecology 236, no. 2 (1984): 99-108. 13 Iacovides, et al., What we know about primary dysmenorrhea today, pg 766. 14 Iacovides, et al., What we know about primary dysmenorrhea today, pg 766. 15 Iacovides, et al., What we know about primary dysmenorrhea today, pg 764-5. 16 Armour et al., The role of treatment timing and mode of stimulation, pg 2. 17 Yang, M., Chen, X., Bo, L., Lao, L., Chen, J., Yu, S., . . . Liang, F. (n.d.). Moxibustion for pain relief in patients with primary dysmenorrhea: A randomized controlled trial. 18 Iacovides, et al., What we know about primary dysmenorrhea today, pg 772. 19 Yang et al., Moxibustion for Pain Relief, pg 12. 20 Armour, M., & Smith, C. A. (2016). Treating primary dysmenorrhoea with acupuncture: a narrative review of the relationship between acupuncture ‘dose’ and menstrual pain outcomes. Acupuncture in Medicine, 34(6), pg 422. 21 Armour et al., The role of treatment timing and mode of stimulation, pg 3. 22 Armour et al., The role of treatment timing and mode of stimulation, pg 4. 23 Armour et al., The role of treatment timing and mode of stimulation, pg 4. 23a Xing-Yue Yang, Guang-Xia Shi, Qian-Qian Li, Zhen-Hua Zhang, Qian Xu, and Cun-Zhi Liu, “Characterization of Deqi Sensation and Acupuncture Effect,” Evidence-Based Complementary and Alternative Medicine, vol. 2013, Article ID 319734, 7 pages, 2013. 24 Armour et al., The role of treatment timing and mode of stimulation, pg 4. 25 Armour et al., The role of treatment timing and mode of stimulation, pg 4. 26 Armour et al., The role of treatment timing and mode of stimulation, pg 4-5. 27 Armour et al, The role of treatment timing and mode of stimulation, pg 5. 28 Armour et al., The role of treatment timing and mode of stimulation, pg 6. 29 Armour et al., The role of treatment timing and mode of stimulation, pg 1. 30 Armour et al., The role of treatment timing and mode of stimulation, pg 12. 31 Armour et al, The role of treatment timing and mode of stimulation, pg 9. 32 Armour et al., The role of treatment timing and mode of stimulation, pg 14. 33 Armour et al, The role of treatment timing and mode of stimulation, pg 1. 34 Armour et al., The role of treatment timing and mode of stimulation, pg 15. 35 Armour et al., The role of treatment timing and mode of stimulation, pg 1. 36 Armour et al., The role of treatment timing and mode of stimulation, pg 14. 38 Armour & Smith, Treating Primary Dysmenorrhea with Acupuncture, pg 422. 39 Armour & Smith, Treating Primary Dysmenorrhea with Acupuncture, pg 416. 40 Zhao, M., Zhang, P., Li, J., Wang, L., Zhou, W., Wang, Y., . . . Zhu, J. (2017). Influence of de qi on the immediate analgesic effect of SP6 acupuncture in patients with primary dysmenorrhoea and cold and dampness stagnation: a multicentre randomised controlled trial. Acupuncture in Medicine. pg 5. 41 Zhao et al., Influence of De Qi on the immediate analgesic effect of SP6, pg 2. 42 Hsu et al., Effects of Acupuncture Applied to Sanyinjiao, pgs 4-5. 43 Armour, M., Dahlen, H. G., & Smith, C. A. (2016). More Than Needles: The Importance of Explanations and Self-Care Advice in Treating Primary Dysmenorrhea with Acupuncture. Evidence-Based Complementary and Alternative Medicine, 2016, pg 5. 44 Armour, Dahlen & Smith, More Than Needles, pg 1. 45 Armour, Dahlen & Smith, More Than Needles, pg 5. 46 Armour, Dahlen & Smith, More Than Needles, pg 7. 47 Armour, Dahlen & Smith, More Than Needles, pg 8. 48 Armour, Dahlen & Smith, More Than Needles, pg 7. 49 Armour, Dahlen & Smith, More Than Needles, pg 5. Researchers find acupuncture more effective than hormone drug therapy for the treatment of endometriosis. Acupuncture relieves menstrual pain due to endometriosis, reduces the size of pelvic masses, lowers CA125 levels, and reduces the recurrence rate of endometriosis. CA125 a is biomarker for several types of cancer and benign conditions including endometriosis and menstrual disorders. Acupuncture reduced pain levels more significantly than the medication. Relapse rates were less in the acupuncture group than the drug group. One year follow-up examinations determined that the recurrence rate for the group receiving drug therapy was 36%. By comparison, the group receiving acupuncture had an endometriosis recurrence rate of 20%. Pelvic mass sizes and proliferation lessened more significantly in the acupuncture treatment group than in the drug group. The findings were detected and verified with B-scan ultrasonography. Inclusion criteria for this study included Traditional Chinese Medicinal (TCM) differential diagnostic pattern differentiation of blood stasis. In TCM, endometriosis is related to the dysfunction of the liver, spleen, and kidneys. In addition, coldness may lead to obstruction of meridians and blood stasis in the uterine region. This impedes qi and blood circulation in the uterus, leading to menstrual pain due to a lack of delivery of vital energy and nutrients to uterine tissues. Endometriosis treatment in TCM focuses on promoting blood circulation, transforming and dissolving blood stasis, and regulating the functions of the liver, spleen, and kidneys. Treatment commenced with patients in a supine position. After disinfection of the acupoint sites, a 0.30 mm × 40 mm disposable filiform needle was inserted into each acupoint with a high needle entry speed. Xuehai, Sanyinjiao, Xingjian, and Taichong were perpendicularly needled to achieve a deqi sensation. Qihai, Guanyuan, Zhongji, and Zigong acupoints were obliquely (in a downward direction, 45°) needled to a standard depth. Needles were rotated, lifted, and thrust rapidly after insertion to achieve a deqi sensation in the pelvic region. Subsequently, the needles were retained and moxibustion was applied to acupoints (Qihai, Guanyuan, Zhongji, Zigong). Moxa cigar cuttings, each 2 cm long, were attached to each needle handle and ignited. Moxa was left in place to self-extinguish. Moxibustion was applied three times per 30 minute needle retention time. One acupuncture and moxibustion session was applied every other day, except during menstruation. The treatment was applied for a grand total of 6 months. Significantly effective: Rating reduction of at least 50%. Significant improvement of menstrual pain. Effective: Rating reduction of at least 25%. Improvement of menstrual pain. Ineffective: Rating reduction of less than 25%. No improvement of menstrual pain. All patients underwent Visual Analogue Scale (VAS) assessments before and after their treatments. VAS is an instrument that measures pain intensity levels experienced by patients. B-scan ultrasonography was conducted to calculate the size of pelvic masses. A CA125 test was also conducted to measure the amount of CA125 (cancer antigen 125) in the blood. CA125 is used clinically in the diagnosis and management of endometriosis. Prior research (Chang et al.) documents that patients with endometriosis have higher levels of CA125 than women without endometriosis. Chang et al. note that the value of CA125 reflects the invasiveness of endometrial tissue beyond a normal locus. Additionally, the Tongji University researchers cite investigations demonstrating that the value of CA125 is related to the severity of dysmenorrhea (menstrual cramping and pain). Compared with the drug group, the acupuncture treatment group displayed a significant improvement in VAS scores. Patients in the acupuncture treatment group had smaller pelvic masses caused by endometriosis and had lower levels of CA125. There is a statistically significant difference between the two groups. The researchers also conducted a follow-up survey after treatment completion. They found that the recurrence incident rate of endometriosis in the treatment group was 20%. The recurrence incident rate of endometriosis in the control treatment group was 36%. The research demonstrates that acupuncture is a safe and effective treatment for the alleviation endometriosis. Subjective and objective data supports the conclusions of the researchers in the controlled clinical trial. Based on the data, acupuncture is found effective for the treatment of endometriosis and lowers relapse rates. The study design was as follows. The study involved the selection of 50 patients at the acupuncture and gynecology departments at the affiliated Tongji hospital of Tongji University. All patients were diagnosed with endometriosis between January 2010 and December 2015. They were randomly divided into an acupuncture treatment group and a drug control group, with 25 patients in each group. The treatment group underwent Traditional Chinese Medicine (TCM) acupuncture therapy and the control group received mifepristone tablets. The statistical breakdown for each randomized group was as follows. The average age in the acupuncture treatment group was 36 (±3) years. The average course of disease in the acupuncture treatment group was 2.49 (±2.11) years. The average age in the drug control group was 34 (±4) years. The average course of disease in the drug control group was 2.87 (±1.89) years. For both groups, there were no significant differences in terms of their gender, age, and course of disease prior to the beginning of the study. The primary acupoints selected for the treatment of endometriosis were the following: Qihai, Guanyuan, Zhongji, Zigong, Xuehai, Sanyinjiao. The researchers provided the TCM basis for the acupuncture point selection. Qihai is located on the Ren meridian. Needling Qihai regulates source qi and blood circulation. Guanyuan is a meeting point of the Chong meridian and the Ren meridian. Needling Guanyuan regulates both the Chong and Ren meridians, promotes qi and blood circulation, and relieves menstrual pain. Zhongji is a meeting point of the three foot yin meridians and the Ren meridian. Needling this point is indicated for benefiting qi and blood circulation and relieving menstrual pain. In a clinical setting, Qihai, Guanyuan, and Zhongji are used as a combination for relieving menstrual pain. Zigong is an extra acupoint and is traditionally indicated for lower abdominal pain due to obstruction of qi and blood. Xuehai is an acupoint on the foot Taiyin spleen meridian. Needling this acupoint regulates qi and blood circulation. Sanyinjiao is a meeting point of the three foot yin meridians. Needling this point fortifies the liver, spleen, and kidneys, which is also helpful for regulating qi and blood circulation and relieving menstrual pain. The focus of this study was to scientifically verify that traditionally indicated acupoints for the treatment of endometriosis are effective. Objective examinations and subjective data confirm that the TCM treatment protocol is both safe and effective for the treatment of endometriosis. Less pain, smaller masses, and improved CA125 levels were documented. Moreover, acupuncture outperformed one type of drug therapy. Shen Q, Lu J. Clinical Observation of Acupuncture-moxibustion for Endometriosis [J]. Shanghai Journal of Acupuncture and Moxibustion, 2017, 36 (6). Around 53 Hemiplegic [one-sided paralysis] patients—36 male and 17 female—between 12 and 80 years were treated with Acupuncture in Shanghai Medical University. Among the 53, 38 were cases of cerebral infraction and 15 of cerebral hemorrhage. The clinical manifestations were hemiplegia contralateral to the brain lesion, sometimes accompanied by aphasia. Acupuncture treatment was begun after restoring consciousness. All patients underwent CT scans of the head as well as lumbar puncture. Occlusion of cerebral arteries leads to ischemia of the brain tissue, causing encephalomalacia and cerebral necrosis which are manifested as low density in CT scans. Hemorrhages caused by ruptured intracranial blood vessels appear as high density shadows with distinct margins. CT scans showed the location and scope of lesions, which were either single or multiple, located bilaterally or unilaterally. Superficial lesions are localised at the cortical surface and the deep lesions involve the internal capsule, thalamus, nuclei of basal ganglia, peri-ventricular white mater and brain stem. The shadows correlate to the extent of thrombosis or homerrhage, and can be estimated by CT scans. Large lesion refers to lesions over 3 cm in length, small lesion to those less than 2 cm, and moderate lesion to those in between. The 10 cases found in CT scans to have multiple lesions were all of the ischemic type. The severity of hemiplegia was classified according to the muscle strengths at six joints, the shoulder, elbow, wrist, hip, knee and ankle, as slight, moderate or severe cases. The muscle strength of mild cases was grade four and above, of severe cases, grade two or less, and moderate cases between two and four. The use of acupuncture was to dredge the channels and collaterals and regulate Qi and Blood in order to promote recovery of the hemiplegic limbs. Electro acupuncture, using relatively strong electric stimulation, was applied for 30 minutes once daily, six days per week for a total of four weeks and acupuncture was given on specific acupuncture points. The effect of acupuncture treatment on hemiplegia was classified into three groups according to the increase in muscle strength. Increase in muscle strength of more than two grades, increase in muscle strength of 1-2 grades and increase in muscle strength of less than one grade. Of the 53 cases, 13 were markedly effective, 31 cases were effective, and nine cases were ineffective. The total effective rate was 83 per cent, and markedly effective rate was 24.5 per cent. Acupuncture treatment was started within three months of the onset of disease. The total effective rate for patients who started acupuncture therapy within three weeks of the onset of disease was considerably higher than patient who began treatment after three weeks. Acupuncture therapy was ineffective for patients with conditions such as pneumonia, diabetes, renal failure or lowered immune resistance.The prognosis for patient complicated with other diseases was not favourable. Researchers find both electroacupuncture and manual acupuncture effective for the treatment of lumbar disc herniations. Song et al. conducted a clinical trial at the Xixiang People’s Hospital in Guangdong, China. Electroacupuncture and manual acupuncture significantly reduced patients’ pain levels. Outstanding positive patient outcomes were recorded for the electroacupuncture treatment group. Patients with lumbar disc herniations receiving electroacupuncture had a 91.8% total treatment effective rate. Improvements included pain reductions, increases in range of motion, and improved straight leg lift testing. A sample size of 123 patients was randomly divided into two groups. In group one, 61 patients received electroacupuncture therapy. In group two, 62 patients received manual acupuncture. For the electroacupuncture patients, the Jiaji acupoints at the specific vertebra corresponding to the herniated lumbar disc, as well as on the two adjacent vertebrae, were selected as the primary acupoints and treated on both sides. Additional secondary acupoints were selected based on individual patient symptoms. For hip pain, the following acupoints were chosen: Huantiao (GB30) and Chengfu (BL36). For calf pain: Weizhong (BL40) and Chengshan (BL57). For lateral calf pain, the following acupoint were chosen: Yanglingquan (GB34), Zusanli (ST36), Kunlun (BL60), and Xuanzhong (GB39). Effective: Waist and leg pain ceased. Straightened leg lift of 70° and above. Normal waist and leg activity regained. Improvement: Waist and leg pain relieved. Improvement in extent of waist movement. Not effective: No improvement in symptoms. The total treatment effective rate was measured as a percentage of patients who achieved at least the “improvement” tier. Electroacupuncture produced a 91.8% total treatment effective rate including pain reductions, increases in range of motion, and improved straight leg lift testing. Song et al. conclude that acupuncture is effective for the treatment of lumbar disc herniations. The research team prefaced their study with background information. Lumbar disc herniation is a common disease among adults. Pain, numbness, or weakness arises due to damage or compression of the nerve root caused by herniation of the nucleus pulposus. This is the soft inner core of the vertebral disc that helps absorb compression and torsion. A herniation occurs when the soft material from the inner core escapes through the outer rings of the disc. This stubborn disease is usually characterized by an abrupt onset with a prolonged or repetitive course of symptomatic flare-ups. Main symptoms include leg and lumbar region pain, and also lower limb motor dysfunction. Lower limb paralysis is possible in severe cases. Song et al. note that acupuncture is a relatively non-invasive treatment for disc herniations that dredges meridians, promotes qi circulation, eliminates blood stasis, and expels wind-dampness. Pain is thereby relieved when blood and qi circulation is restored. In modern terms, acupuncture stimulates parasympathetic tone and downregulates excess sympathetic nervous system activity. Resulting decreases in the inflammatory cascade of endogenous biochemicals results from the regulation of the autonomic nervous system. Song et al. add that acupuncture regulates nerve activity, facilitates muscles relaxation, mitigates muscular spasms, dilates blood vessels, improves blood circulation, and also reduces both edema and inflammation. The Jiaji acupoints, located on the back beside the Du meridian, are used to treat diseases related to the corresponding affected nerve segments. Electroacupuncture utilizes electrical stimulation to facilitate the regeneration of damaged nerves by improving nerve cell metabolism and nerve cell enzyme activity. The basis of this is that electroacupuncture forms a localized, stable, and subtle electric current that boosts the electrophysiological properties of nerve cells (Sun, 1996). In a related study, Wang et al. conducted a meta-analysis on the efficaciousness of acupuncture for the treatment of lumbar disc herniations. Without exception, the clinical investigations demonstrate that acupuncture is a safe and effective treatment modality for lumbar disc herniation patients. The following are examples of studies included in the meta-analysis. Liu et al. investigated the efficacy of conventional acupuncture therapy. Conventional acupuncture treatment was administered by first identifying the vertebrae with lumbar disc herniations. Corresponding Du meridian acupoints and the two adjacent Jiaji acupoints were needled. The identified acupoints were treated with the Shao Shan Huo (Setting the Mountain on Fire) needling technique. Patients were treated for 10 consecutive days and achieved a 95% total treatment effective rate. Shao Shan Huo is a powerful tonification needling technique in Traditional Chinese Medicine (TCM). Needles are inserted and stimulated to elicit the arrival of deqi for purposes of reinforcing qi. When applied properly, the patient feels a warm sensation at the needle region. In addition, the skin will be flush red as a result of enhanced micro-circulation of blood. Initially, the needle is inserted slowly to superficial depth beneath the skin. During the procedure, lifting and thrusting is applied to three levels of depth beneath the skin, starting with the most superficial level at approximately a 0.5 cun depth. This is followed by lifting and thrusting at the middle level at approximately 1.0 cun and the deep level at approximately 1.5 cun. Depth varies according to patient size and acupoint location. At each of the three depths of insertion, the needle motion combines quick and forceful thrusting with slow and gentle lifting for a total of nine times. Rotation may also be applied with the same techniques. After stimulation at all three levels is complete, the needle is lifted to the superficial level and the procedure is repeated, often three times, to ensure elicitation of a qi sensation producing heat and redness of the skin. The patient may also sweat in the region of the needle or throughout the body as a result of the heat sensation produced by this tonification method. Liu et al. achieved a 95% total treatment effective rate using the Setting the Mountain on Fire technique using the Du and Jiajia (Huatuojiaji) acupuncture points at correlated regions to lumbar disc herniations. Notably, acupuncture was applied for 10 consecutive days. Deng and Cai’s investigation also examined application of the Jiaji acupoints for the treatment of lumbar disc herniations. In a different approach to needle stimulation, Deng and Cai applied electroacupuncture stimulation to the needles. They achieved significant levels of positive patient outcomes in their clinical trial. In their investigation, patients were treated every other day. Short-term results and a three month follow-up confirm significant clinical improvements. He et al. measured improvement rates after three weeks of acupuncture therapy. Patients achieved significant improvements. 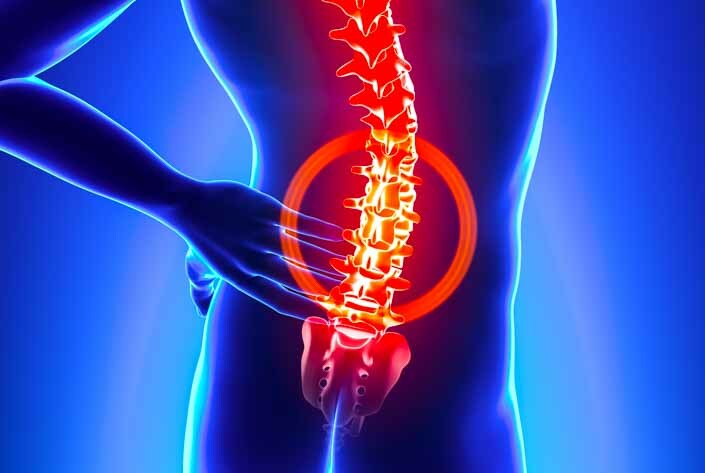 The researchers conclude that the protocol is effective for the treatment of lumbar disc herniation symptoms. He et al. used several acupoints termed ‘extra’ points including Xiafengshidian, Xiafengshixiadian, and Qipang. The acupoints demonstrate that the researchers focused on abdominal acupuncture as a means of treating lumbar concerns. Xia Feng Shi Dian (Xia Feng Shi Dian, Lower Wind-Damp Point) is located 2.5 cun lateral to CV6 and is indicated for the treatment of knee disorders, including postoperative swelling and pain. Xiafengshixiadian (Xia Feng Shi Xia Dian, Below Wind-Damp Point) is located 3 cun lateral to CV5 and is used for leg, ankle, and foot disorders. Qipang (Qi Pang, Beside Qi) is located 0.5 cun lateral to CV6 and is indicated for lower back and leg pain, swelling, and weakness; including postoperative disorders. The meta-analysis included the clinical research of Zhang et al. Manual acupuncture was applied to acupoints surrounding the afflicted area. All needles were directed towards the center of the afflicted region. Zhang et al. achieved a 97.5% total treatment effective rate. Overall, the metal-analysis by Wang et al. documents that acupuncture is a safe and effective treatment modality for patients with lumbar disc herniations. Implementation of Jiaji acupoints was common across several studies. Other techniques including abdominal acupuncture and local Ashi acupoint acupuncture also demonstrated clinical effectiveness. Both electroacupuncture and specialized manual acupuncture demonstrated effectiveness as well. As a result of the findings, the researchers conclude that acupuncture is an important treatment option for patients with lumbar disc herniations. Song YJ, Yu MJ, Li L, Huang WX, Cai ZW, Su DP. (2013). Clinical Observation of Electro-acupuncture in Treatment of Lumbar Disc Herniation. Chinese Manipulation & Rehabilitation Medicne. Sun ZR. Mechanism of acupuncture in the regeneration of surrounding damaged nerves. 1996(02). Wang FM, Sun H, Zhang YM. (2014). Advance of Clinical Research in Intervention of Lumbar Disc Herniation（LDH） with Acupuncture Moxibustion. Journal of Clinical Acupuncture and Moxibustion. Deng W & Cai LH. (2011). Electroacupuncture on Jiaji acupoint in treating lumbar disc herniation. Journal of Clinical Acupuncture. (7). He JX, Lin WR, Chen JQ, Huang Y, Wang SX, Lin HH & Chen HX. Abdominal acupuncture in treating lumbar disc herniation. Shanghai Journal of Acupuncture. 2012. (7). Liu YZ, Sun XW & Zou W. (2012). Shao Shan Huo acupuncture technique on lumbar Jiaji acupoint in treating lumber disc herniation. Journal of Clinical Acupuncture. (6).